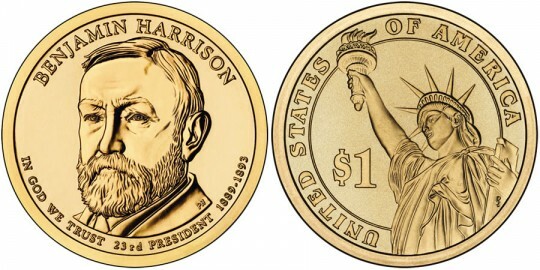 The 2012 Benjamin Harrison Presidential $1 Coin will mark the third of four Presidential $1 Coins issued by the US Mint in 2012. Shown on the obverse of the coin will be a portrait of Benjamin Harrison who served as the 23rd President of the United States during the years of 1889-1893. The US Mint first released Presidential $1 Coins in 2007 and has since continued the series at a rate of four per year. Coins of the program are released in the order in which the honored individual on the obverse of the coin served in office beginning with the George Washington Presidential $1 Coin. Strikes of the series are scheduled to appear at least until 2016 but will continue past that point if needed to insure all qualified individuals have been honored by the program. Benjamin Harrison defeated incumbent President Grover Cleveland for the Presidency in 1889. Benjamin was the grandson of the 9th President of the United States William Henry Harrison. His administration is probably most remembered for its spending leading to the first annual budget of over one billion dollars. Shown on the obverse of the coin is a portrait of Benjamin Harrison. The obverse also includes the inscriptions of "BENJAMIN HARRISON," "23RD PRESIDENT," "1889-1893" and "IN GOD WE TRUST." The inscriptions of "UNITED STATES OF AMERICA" and "$1" are joined on the reverse with a likeness of the Statue of Liberty. Don Everhart is the artist of record for the reverse design.